At a novice level you do not need a tutor or teacher! Yes that’s right, you don’t need a tutor to teach you how to speak Cantonese. A tutor at the beginning stage is simply a waste of money. Over the last many years living in Hong Kong, I’ve met around 15 or so westerners who all came with the intention to learn Cantonese. They were all psyched up and ready to get good without any actual study. After 4 years they cannot speak more than a few broken sentences, and that is simply to buy their cha-siu fan. You also cannot just find any random native speaker to teach you Cantonese! Anyone who claims they can tutor or exchange Cantonese is conning you of your time and money! What you need to do is learn proper language learning methods. If you have time, go to Google and search for “krashen”, “comprehensible input” and perhaps “steve kaufmann”. There is no short cut to learning Cantonese, other than lots of boring repetitive listening, and learning lots of words. Cantonese DOES HAVE grammar, but not in the same way as French might have. I once had a discussion with an ex-colleague from Germany who basically argued that Cantonese has no grammar and you could randomly string words together in any order. He spent more time learning *about* Cantonese than actually learning it! Many people are convinced they can only learn from a classroom, and only learn by speaking to a native. You can be more efficient if you buy a book that has lots of dialogues, jyutping/yale, and mp3 audio. You simply need to map words to definition (I prefer to learn each word by translating into English first) and then repeating the audio 100-200 times or until you can basically memorise what you heard. Make targets or milestones by learning 200 new words per week! I used to learn 500 words per week back in my intensive study days several years ago. Also be consistent and stop being lazy! You must learn a romanisation method (yale or jyutping) and know the tones. Otherwise, you will sound clumsy and not be able to properly look up new words in the online cantonese dictionary. Remember, learning new words is critical to getting fluent! But I must have a tutor because I was brainwashed to believe a teacher is a must? The cost for a Cantonese tutor is HKD$100/hour (1-on-1 private lessons) and that is someone who knows the 6 tones. You don’t need to pay more than this price and more expensive doesn’t make it any better. If you absolutely insist you need a tutor, have your tutor create dialogues for you by writing out 1 minute stories that teach you new vocab (10-15 new words per dialogue), go over all the vocab by telling you the meaning in English (or whatever your mother tongue is) and record the MP3. When your 1-2 hour lessons are finished, spend 4-5 hours per day listening to these dialogues over and over until you are sick of them! Repeat this every day (even holidays)! But I’m not like you, I don’t have 4-5 hours per day as I’ve got a life and I have 100 other excuses…. Don’t be a wimp and stop making excuses. I spent 1 hour on the train/bus in the morning listening to my audio, 1 hour during lunch, 1 hour on the bus/train back home after work, 2 hours before bed etc etc…. that’s already 5 hours per day! Add an extra few hours while shopping, buying groceries, eating, going to the toilet, walking, jogging, at the gym! Now you can see you can easily get 7-8 hours per day. Successful people don’t make excuses for why they cannot, they find ways of achieving things by doing whatever it takes to get there! Edit: Oh wait… It’s not really free… They entice you to upgrade to a basic account $4/month to extend your access to get the full archive of lessons. However, you could always grab everything and not continue the following month. I came across this video explaining what it takes to “master” a language. There is a rule of 10,000 hours in order to master anything. It would take 30 years of 1 hour per day to master a language, 10 years of 3 hours per day, 5 years of 6 hours per day and so on. Then why is it that people can go overseas and speak very good in whatever language they are studying etc… The point is “good” but not “master”. There is another rule called “pareto principle” describing the 80-20 ratio of achieving something. This means it would take 20% of time to achieve 80% results, but 80% of time to achieve the remaining 20% of results leading to mastery. So this brings me back to my Cantonese. I could say I speak it “well”, but far from near native. It also be maybe people are adjusting themselves when talking to me since I would need a mighty lot of years to get that last 20%. Anyway, this is a good video and makes me realise how much hard work you need. I actually bought this book online a year ago from America. Learnt tons of swear words, slang, daily conversation words, rude sayings and tons of informal words. I’m also told the book is up to date and doesn’t contain out of date phrasing. Contains Chinese characters and Yale Pinyin. Much of the content isn’t even slang, very common and useful. 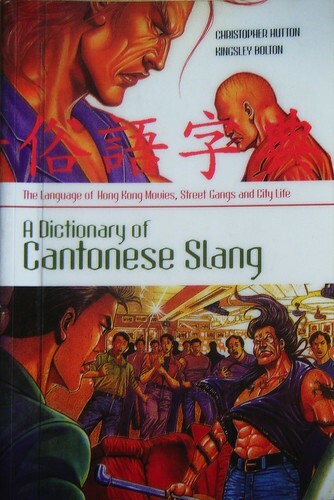 Not really a Dictionary of Cantonese Slang, but rather a Dictionary of Cantonese with over 500 pages and 195megs!